How to Celebrate Star Wars Day: May the Fourth Be with You. Star Wars: A sci-fi trilogy that was first scoffed at before proving to be a creative success—and one that would continue to be successful for many years. Each year, National Star Wars Day is celebrated (unofficially) as a day to commemorate the Star Wars series and the rich world that embodies it. A film trilogy that went beyond what was normal and enriched the life of many a viewer, Star Wars leaves those familiar with it “quotable” quotes and iconic characters (like Princess Leia). But what day is Star Wars Day, really? Let EnglishClass101.com teach you all you need to know about this ever-growing United States holiday. We hope to make it both fun and informative. So let’s get started! 1. What is Star Wars Day? In the United States, fans of this sci-fi trilogy celebrate Star Wars Day, for no other reason than the aforementioned phrase. You see, one of the most popular phrases in the trilogy is, “May the Force be with you,” which can be altered to reflect the date May Fourth. And so someone with too much time on their hands to think about this made Star Wars Day a thing (one of the first times the Fourth was mentioned this way was in 1979!). Each year on May 4, National Star Wars Day is observed (May the fourth be with you!). As Star Wars Day is an unofficial holiday in the United States, there’s no established way to celebrate it (and some people forego it altogether!). If you’re in the U.S. on May 4, though, expect to be greeted with a hearty “May the Fourth be with you,” at every turn. Aside from this phrase, celebrations may include Star Wars-themed parties, watching a Star Wars marathon, playing Star Wars games, or baking cookies shaped like Star Wars characters. Further, social media is bound to be filled with hashtags galore about Star Wars Day! Did you know that the creator of Star Wars, George Lucas, faced numerous struggles during the creation process? In particular, he was notorious for writing poor dialogue; he grew frustrated that he needed help, thus limiting his creative abilities. On top of this, he faced strong criticism concerning Star Wars as a whole; people thought it wouldn’t market well. But despite these struggles and frustrations, Lucas managed to create a very successful trilogy—one worthy of having its own special day each year, upheld by diehard fans. Hopefully Lucas’s struggles and successes will give you encouragement and boost your confidence. You don’t have to be perfect to truly make a mark and reach your dreams. Here’s some vocabulary you should know for Star Wars Day! To hear each vocabulary word pronounced, check out our Star Wars Day vocabulary list, where you’ll find each word accompanied by an audio file of its pronunciation. You’ll also find images of these unique (and sometimes fictional) words! What do you think about National Star Wars Day? Does your country celebrate Star Wars Day too, or maybe a similar secular holiday? Let us know in the comments! To learn more about culture in the United States and the English language, visit us at EnglishClass101.com. You’ll find just the study materials you need to master English and start speaking like a native! From insightful blog posts to free vocabulary lists to strengthen your word knowledge, we have something for every English learner. You can also use our forum to discuss lessons with fellow students, or gain a one-on-one learning experience with our MyTeacher program! Know that your hard work and determination will soon reap benefits, and it’s all worthwhile. EnglishClass101.com will be for every step of your language-learning journey! Until next time, Happy National Star Wars Day! Easter Sunday is one of the most popular and vastly celebrated holidays in the United States. Christians take Easter to commemorate the resurrection of Jesus Christ, while the secular population finds numerous ways to enjoy this popular holiday with family and friends. By learning about the meaning of Easter Sunday to Americans, as well as how it’s celebrated across the country, you’re also getting a glimpse of American culture—both the religious and the secular. This, in turn, will lay down for you another stepping stone in your journey to mastering the English language. At EnglishClass101.com, we hope to make this a fun experience as you learn about the Easter bunny, Easter eggs, and the religious side of this holiday. Let’s get started! 1. What is Easter Sunday? Easter Sunday, one of the most prevalent holidays in the United States, is celebrated by both religious and non-religious citizens. Secular events, as well as family celebrations and traditions, take place all across the country. Christians celebrate the holiday to commemorate the resurrection of Jesus Christ, and do this through special events all through the weekend. What day is Easter on, and when is Easter this year? The date of Easter Sunday varies each year. For your convenience, here’s a list of this holiday’s date for the next ten years. Due to the diversity of denominations in the United States, there are various Easter Sunday traditions across the country. For instance, some people hold a vigil for the entire night before Easter. In the United States, both the religious and non-religious celebrate Easter Sunday. Whether or not they attend any church, most people in the United States enjoy spending time with family and enjoying large feasts together. While some people observe Easter Sunday for its religious significance, others simply see it as a celebration of spring’s beginning. On the religious side of it, many people attend church services on Easter Sunday. There are some churches that put on special parades for the holiday, while others put together simple get-togethers for its members, such as a picnic or potluck, to enjoy good food and Easter desserts. Secular events include hunting for Easter eggs as well as other activities for children. These events aren’t necessarily religious and anyone is invited to participate. Oftentimes, community events take place for this notable holiday when people like getting together. More symbols of this holiday include the Easter Bunny, eggs, and flowers. Additional symbols related to spring are associated with Easter, and are still important traditions for this particular holiday. Many churches hold service before daybreak, often called a “Sunrise Service.” During these services, Christians arrive before the predawn hours and hold the service as the sun rises. Many people consider this a powerful symbol. Here are some vocabulary words and phrases you should know for Easter Sunday in the United States! Candy: Many people put candy inside of colored plastic Easter eggs, as a sweet gift for the person who finds it. Easter: Easter is usually a shortened term for Easter Sunday. Rabbit: Rabbits have long been associated with the Easter holiday in the United States, largely because they begin emerging during the spring. Chocolate: As most children (and adults!) can attest to, chocolate is a favorite candy to find hidden inside an Easter egg. Egg: Eggs are another symbol associated with Easter, likely because they represent new life (many Christians also associate an egg as being like a tomb, like the one Jesus was buried in before his resurrection). Tulip: The tulip is yet another symbol of Easter. Chick: Chicks, like rabbits, are associated with Easter largely because of their cuteness and because they symbolize new life at the beginning of spring. Lamb: The lamb is a symbol of Easter for more than one reason. First of all, Jesus is considered by Christians to be the “Lamb of God,” and so the lamb is associated with this concept. Further, a lamb is the offspring of a sheep, once again reflecting the concept of new life in spring. Hide Easter eggs: Hiding Easter eggs is a favorite activity among many American families during Easter. These eggs are the same colored plastic ones mentioned above, filled with candy. Sometimes these are hidden all around a family’s home, sometimes outside, and sometimes in large fields or similar areas for many families’ children to search at once. Look for Easter eggs: Children (and sometimes adults!) look for the hidden Easter eggs to enjoy the candy inside. Hard-boiled egg: Some families like to hard-boil eggs, either for eating or to dye them different colors for fun. Easter egg: An “Easter egg” in the United States usually refers to a piece of plastic shaped like an egg, and is usually pastel-colored. People like to put candy (or sometimes money!) inside of them, to hide for their children to find. Easter Bunny: The “Easter Bunny” is an imaginary creature that many parents tell their children about to help bring fun to Easter. It’s often said that the Easter Bunny is the one who lays and hides the Easter eggs. Easter basket: An “Easter basket” can mean either a high-end, lovely basket (usually woven) or a more low-end plastic basket (or bucket) used for decoration or collecting Easter eggs. Dye eggs: Dying eggs is another favorite tradition among some United States families on Easter. Sometimes the eggs are hard-boiled beforehand, but oftentimes they’re dyed raw. People enjoy dying them pastel colors. Decorate: People like to decorate for Easter, and this is usually done with things of pastel colors and Easter symbols. Jellybean: “Jellybeans” are another common Easter egg candy, and are sometimes considered more practical to use than chocolate since they won’t melt as easily sitting out in the hot sun. These are chewy and come in numerous flavors. To hear each word and phrase pronounced, check out our Easter Sunday vocabulary list. Here, you’ll find each word accompanied by an audio of its pronunciation. We hope you enjoyed learning about Easter Sunday in the United States with us! Does your country celebrate Easter? What do Easter celebrations look like in your country? Let us know in the comments! To learn even more about United States culture and the English language, visit us at EnglishClass101.com! We offer an array of insightful blog posts, free vocabulary lists, and an online community to discuss lessons with English learners. You can also upgrade to Premium Plus to take advantage of our MyTeacher program and learn English with your own personal English teacher! At EnglishClass101.com, we hope to make your learning journey more fun, while providing you with the information and support you need to master the English language. Know that your hard work will pay off, and before you know it, you’ll be speaking like a native. In the meantime, please do have a happy Easter! If you plan on moving from your home country to the United States, one of the most important things is finding a good job. Maybe that’s what’s pulling you to the U.S. in the first place! Either way, you don’t want to start your life in a new and exciting country struggling to find work. We’re sure that while you plan your move, there are dozens of other things for you to worry over and focus your energy on. So we thought we’d make it easier for you to find a job in the USA by providing you with useful information and helpful tips to give you some footing in the often overwhelming world of job hunting. EnglishClass101.com has your back as you seek to find a job in the USA! Without further ado, here’s our guide on how to find a job in the USA. Why Get a Job in the USA? What to Expect. 1. Why Get a Job in the USA? What to Expect. Getting a job anywhere can be both beneficial and frightening. So how does this apply to finding work in America? This list offers just a glimpse of what you can expect to gain from working in the United States. When it comes to visas, we know that things can get a little bit hazy and confusing. It may be a good idea to brush up on the different work visas so that you know which one you should apply for. 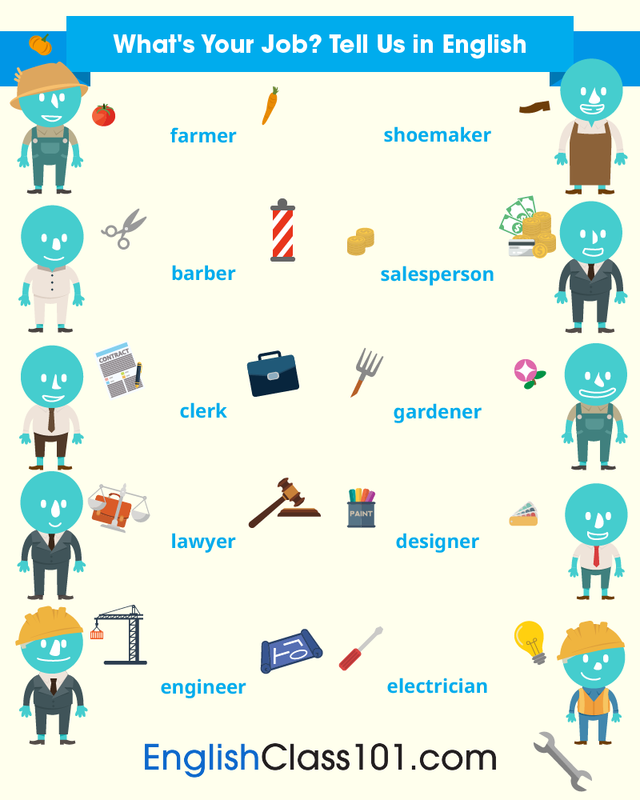 Now that you have a little more info under your belt, let’s continue forward and learn more about how to attain jobs in the United States, based on type. Keep in mind that these are job-hunting skills you can ultimately take anywhere, and they’ll save you from a miserable time struggling to find work in a new country. While looking for a job in America, it’ll be immensely helpful for you to know where to look. If you already know where in the United States you’ll be relocating to, you probably have a good idea already of what work is available there. But if you’ve yet to make a firm decision, or have no idea where to start, you may find this short list of U.S. cities with the highest job demand quite helpful. Note that there’s a lot of work available in the state of California in particular, perhaps making it the best place to find work in America in terms of job volume (though we’re sure you’ll want to consider multiple factors apart from this in your search). One thing that the majority of U.S. states and cities share in common is this: They’re nearly all looking for skilled workers in the Health/Science/Technology realm; this seems to be especially true of California. So if you happen to work in this field already, or are interested in beginning, moving to the United States for work may be just the right move for you. As stated earlier, the United States is a country with good job opportunities in numerous fields. These range from blue-collar jobs to those in teaching, and of course, Health/Science/Technology. What’s the best way to find these jobs? Which cities have high demand for these types of jobs? What do I need to attain these jobs? Let’s go through and try to answer your questions for each job category so that you can more easily find a job in the USA. Choosing to teach is a noble endeavor, and one of lasting value.Tack on to that the fact that there’s a large need for language teachers throughout the United States, and you’ve framed for yourself a couple of good reasons to pursue a teaching career in the U.S.—whether for the long- or short-term. USA Employment: A program that helps teachers from other countries find short-term teaching jobs in the United States. Indeed.com: This popular job-hunting site features numerous job postings for foreign language teachers. Definitely worth checking out. SimplyHired.com: Another website with a good array of foreign language teaching job postings. Glassdoor.com: One of the most popular U.S. job-searching sites, Glassdoor is a good place to look for quality teaching jobs. LinkedIn.com: A LinkedIn account is a great tool for finding a good job in any field, and is especially geared toward professionals (like teachers!). Once you have everything set in order—be patient!—you should have a much easier time attaining the teaching job you want in the United States. Bluecollarjobs.us: This site provides good information in graph form of how each state compares in terms of blue-collar job availability. You’ll also find useful information about the various fields within this industry in its “commentary” section. Bluecollarjobs.com: Working with CareerBuilder, this site specializes in helping people find the best blue-collar jobs for themselves. Bluecollarcrossing.com: Here you’ll find a slighter broader range of blue-collar jobs in the United States. Glassdoor.com: This is a good site for finding just about any job. Indeed.com: Here you can find a nice variety of blue-collar work currently available throughout the country. LinkedIn.com: Creating a LinkedIn account and making connections can help you find a blue-collar job with your name on it. This industry is pretty high in demand throughout the United States, particularly in the state of California. You’ll also find that Seattle, WA and Boston, MA are good areas of the country to find health, science, or technology jobs. Google: Google is Google. This is a company with some pretty lucrative positions; if you’ve got the stuff and a desire to work with a company like this, pursuing a career with Google may be a great option for you. Apple: Everyone knows Apple, and finding a job with this top-notch company may be a good direction to take in your technology-geared career. Labs: Maybe you’re more interested in finding a career that allows you to experiment and work alongside others for the greater good. The United States has lots of lab jobs available to foreigners. Hospitals: If your heart and experience lead you to the healthcare industry, you can find several great job openings on HospitalCareers.com. The standard requirements for health, science, and technology jobs in the United States are roughly similar to those for other types of jobs—though keep in mind that it’s good to be fluent in English, and you’ll need relevant education and experience to pick up one of these much-needed jobs. Depending on your circumstances and work preferences, a part-time job may be more up your alley than a full-time job. The options here are boundless, as part-time jobs in the USA can be had in just about any field of work. Jobs.goabroad.com: Here you’ll find some fascinating tourism-related jobs just about anywhere in the world. You may want to check out this website, especially if the United States won’t be the last stop on your journey. Indeed.com: This website features several openings for tourism jobs in the United States. Glassdoor.com: Of course, you can also find a few great tourism jobs on Glassdoor.com. The United States offers unique opportunities to those who wish to begin a freelancing career, become self-employed, or start/expand their small business. In this country that’s largely focused on the individual and the magic of becoming one’s best, the concept of “working for yourself” is being lived out by more and more people. This said, it’s not too hard to find remote jobs in the USA, as long as you have the experience, skills, and equipment required. If this is a direction you’re interested in heading in, know that the road may be tough (especially as a foreigner) but the rewards will be well worth the success you can reach. The two differ in terms of requirements and expectations, so you may want to brush up on starting your business in the USA. You now know where to find jobs in the United States and have more information on how to find a job in America as a foreigner. But the search itself is not enough. The art of communication via your resume, cover letter, and the interview(s) will have to carry you the rest of the way. Contact Information: This includes your full name, your address, your phone number, and your email address (if desired). Depending on the type of resume you’re writing and the job you’re after, you can also include a title for yourself (e.g. “Writer,” “Marketing Associate,” or “Sous chef”). One page: Let’s call this the Golden Rule of resumes. If at all possible, keep everything on just one page, as anything longer is more likely than not to bore your potential employer (or leave them unimpressed). 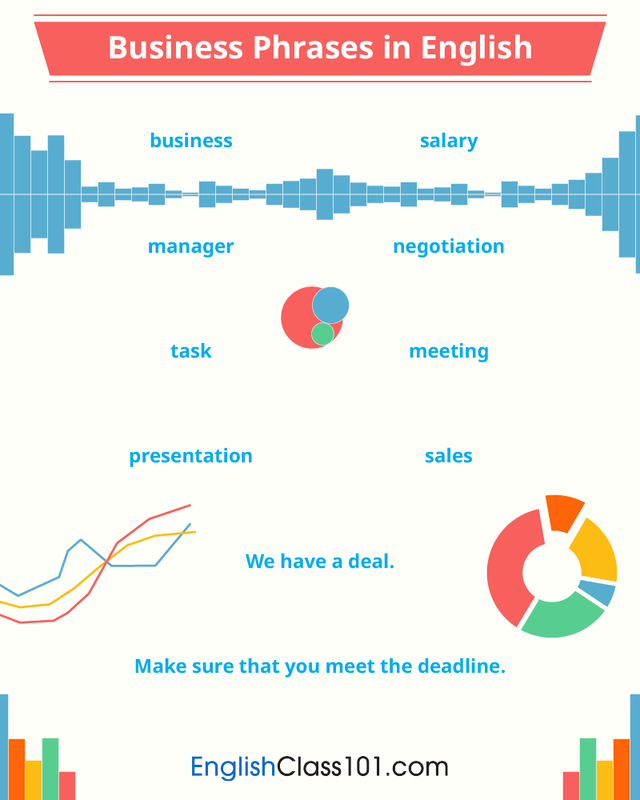 What’s more impressive than the efficiency and precision of a one-page resume? Education/Experience first: Depending on your past experience in the job market (or lack thereof), your education or experience information should be the first thing (after your name and contact information). If you’re just out of school or currently a student without much work experience, put your education information first; if you do have prior work experience, be sure to include that first instead. Relevant Skills: After you’ve put down the information on your education and experience, the next thing you should include are your relevant skills. What are you good at or knowledgeable about that makes you ideal for this position? This information should typically be in bullet list format, with 3-5 bullets. Serves as Outline for Cover Letter: When crafting your resume, keep in mind that it should also serve as the outline for the next step: your cover letter. Everything in your cover letter will be drawn out and highlighted in your cover letter, to further impress your potential employer and help them get to know you better before the interview. Essentially, the cover letter is designed to fill in the details of your resume, and to expand upon it. It’s important to do this as concisely as possible, and in such a way that exudes confidence and interest in the company or position you’re applying for. Following the same suit of the resume, this should be only one page. In the top left-hand corner of the page, you’ll need to address the person you’re contacting about the job. You do this by typing their name, their job title, and then the company’s address. Start your cover letter with something along the lines of “Dear Mr. (Mrs.) Name,” insert a couple of line breaks, and begin writing. Ensure that there’s enough room at the end of your letter for you to sign. You do this by typing something along the lines of “Sincerely,” inserting three to four line breaks to create white space, then typing out your full name. Once the page is printed out, sign your name with a pen in the white space between “Sincerely” and your typed name. It’s easy to put things down on paper, but sometimes harder to write them in your body language and tone of voice. Once you’ve made it to the interview stage, it means your resume and cover letter sparked interest in your potential employer. The interview should reiterate your value to the company. Honestly, the types of questions you can expect to be asked during your interview depends on several factors, from the company’s values, to your potential employer’s personality, and even what you put in your resume and cover letter. Why are you looking for a job? / Why did you quit your last job? What previous job was most like this one, and why? However, some employers or companies have different standards when it comes to the interviewing process. So you may want to prepare yourself for some offbeat questions, especially if you plan on applying for a position with a large company. Also, remember that you’ll definitely want to be fluent in the English language for this interview, as this will simplify the process as a whole and earn you some brownie points. No matter the country you’re in, the way one dresses speaks volumes about that person. And a job interview is the most important situation in which to ensure you make a good impression through your physical appearance. Suit, tie, dress pants, and nice shoes. Nice (and modest) blouse, dress pants or skirt at least knee-length, and nice shoes. To find a job in the United States can be stressful for anyone, and requires more than its fair share of patience; this may be especially true as a foreigner coming to work here. We hope that this article was helpful to you and provided you with the information you need on how to get a job in the USA. If you’re looking to improve your English language skills or want to learn more about the culture in the United States, EnglishClass101.com has plenty of information for you. From vocabulary lists to articles on U.S. culture, we have everything you need to make the most of your English-learning endeavors. If you’re the on-the-go type, also be sure to check out our mobile apps! We know that to find a job in America for foreigners can be downright difficult. But with the right knowledge and enough practice, we know you’ll not only master the language, but find success in your career pursuit in the United States! We wish you the best of luck. Irish-Americans have contributed much to the United States, and St. Patrick’s Day, to a large extent, is about celebrating that. St. Patrick’s Day is also about celebrating the culture from which Irish-Americans come. While St. Patrick’s Day’s history may be a bit complex, it has affiliations with the Catholic Church and is also recognized as one of the biggest nights of the year to go out to the local pubs and taverns. In the U.S., you’ll find that Saint Patrick’s Day is just a big party. Learn more about St. Patrick’s Day with EnglishClass101.com! We make it both fun and insightful. Let’s get started. 1. What is St. Patrick’s Day? St. Patrick’s Day is an extremely popular United States holiday. It combines a celebration of Irish culture with a great excuse to get out, let loose, and have some fun. It has been celebrated since the eighteenth century, making it one of the most enduring holidays in the United States. St. Patrick’s Day’s meaning in the United States is largely cultural, considering the significance of Irish Americans in U.S. history. St. Patrick’s Day is a celebration of the Irish culture and just a day to enjoy oneself (while dressed in green, of course). Continue reading to learn even more about Saint Patrick’s Day and its unique traditions. 2. When is St. Patrick’s Day? What day is St. Patrick’s Day? Each year, St. Patrick’s Day is celebrated on March 17. You can find a little more information on why this date is significant in the Additional Information section. 3. How is Saint Patrick’s Day Celebrated? If you want to see a big St. Patrick’s Day parade, New York is the place to be. Every year since 1762, this parade has been put on, and it’s one of the country’s most vibrant, vivacious, and largest celebrations. There are parades held across the nation, and most of them date back to the nineteenth century or earlier. St. Patrick’s Day parades see a large attendance each year. Green, the color most associated with Ireland, is a huge part of St. Patrick’s Day. Americans typically try to sport something green on St. Patrick’s Day to show their support for the Irish-American community and their acknowledgment of the importance of the day. One popular American tradition is to pinch anybody who fails to wear green on this holiday. In some cities, rivers and fountains are dyed green temporarily to celebrate this special day for Irish-Americans. In 1780, George Washington gave March 17th to his troops as a day to celebrate the Irish fight for independence. He considered this an act of solidarity with the Irish people, of whom made up a large number in his army. Here’s some vocabulary you should know for St. Patrick’s Day! Guinness — A popular dry stout Irish alcoholic beverage. Irish Americans — People whose families came from Ireland to live in America. St. Patrick’s Day — A day observed by the Irish to commemorate the patron saint of Ireland. St. Patrick’s Day parade — A parade that takes place in America on St. Patrick’s Day. Pinch — To squeeze or compress between the finger and thumb. Leprechaun — Mythical, elf-like person from Ireland. To hear these words pronounced, you can check out our St. Patrick’s Day vocabulary list. Here, you’ll find each word accompanied by an audio of its pronunciation, as well as a video about the holiday. Now you know all about Saint Patrick’s Day celebrations in the United States! What do you think of this holiday? Is there a similar holiday in your own country? Let us know in the comments! To learn more about the English language and culture in the United States, visit us at EnglishClass101.com. We offer an array of insightful blog posts, free vocabulary lists, and an online community where you can discuss lessons with fellow students. You can also upgrade your account to begin using our MyTeacher program, so that you can learn English one-on-one with your own personal English teacher. Know that your hard work will prove worth it, and you’ll be speaking English like a native before you know it! For now, we’ll wish you a happy St. Patrick’s Day! Do you often feel lonely and sad? Do you long for romance and are willing to do whatever it takes to meet that special person? Speaking another language could revolutionize your love life! So, why wait? Learning how to say ‘love’ in English could be just what you need to find it. Or perhaps you were lucky, and have found your English partner already. Fantastic! Yet, a cross-cultural relationship comes with unique challenges. Learning how to speak your lover’s language will greatly improve your communication and enhance the relationship. At EnglishClass101, our team will teach you all the words, quotes and phrases you need to woo your English lover with excellence! Our tutors provide personal assistance, with plenty of extra material available to make English dating easy for you. Will Falling in Love Help You Learn English Faster? So, you have met your English love interest. Congratulations! Who knows where this could take you…?! However, the two of you have just met and you’re not ready to say the English word for love just yet. Great, it is better to get to know him/her first. 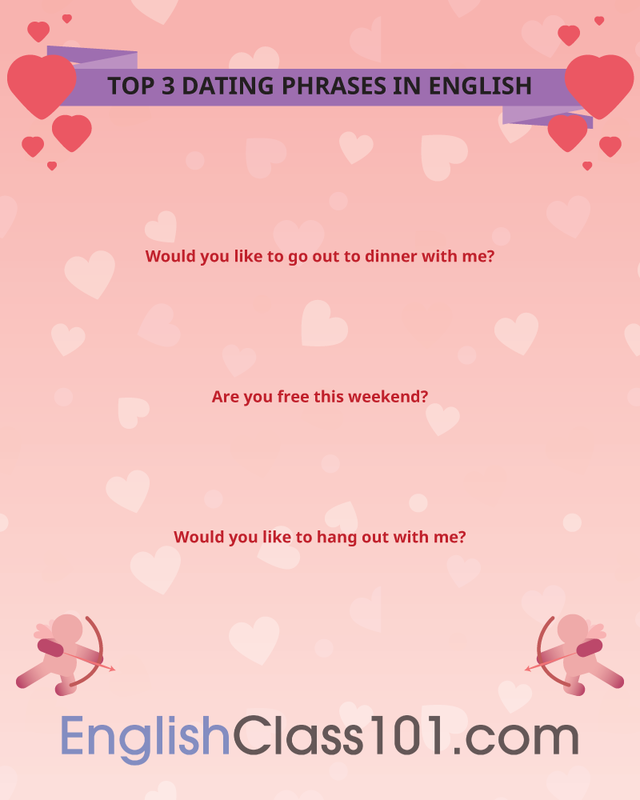 Wow your prospective love by using these English date phrases to set up a spectacular first date. The important question! In most cultures, this phrase indicates: ‘I’m romantically interested in you’. Flirting in English is no different, so don’t take your date to Mcdonald’s! This another good conversation starter. Show off your English language skills! You learned all the English phrases to make a date - congratulations! Now you have to decide where to meet, which can be tricky. Discuss these options with your lover to gauge whether you like the same things. 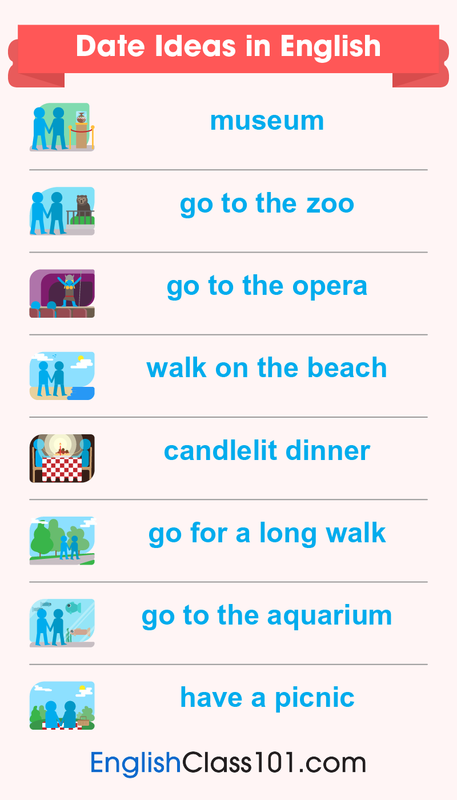 Check out romantic date ideas in English below! Expressing your feelings honestly is very important in any relationship all year round. Yet, on Valentine’s Day you really want to shine. Impress your lover this Valentine’s with your excellent vocabulary, and make his/her day! We teach you, in fun, effective ways, the meanings of the words and how to pronounce them. 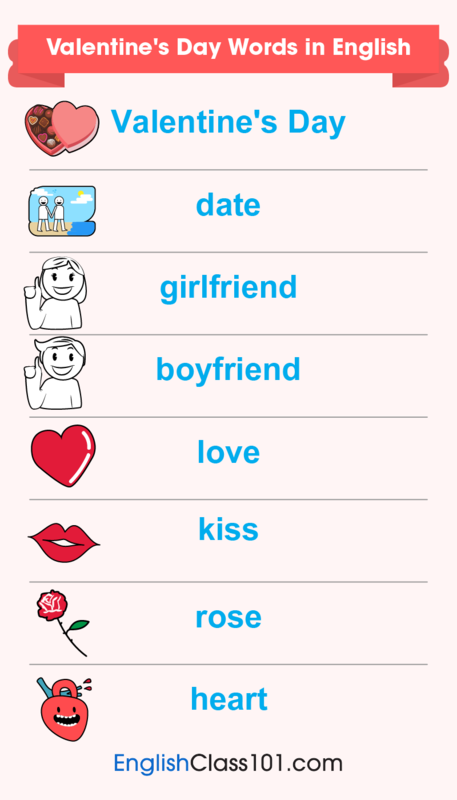 You can also copy the characters and learn how to write ‘I love you’ in English - think how impressed your date will be! So, you now have the basic Valentine’s Day vocabulary under your belt. Well done! But, do you know how to say ‘I love you’ in English yet? Or perhaps you are still only friends. So, do you know how to say ‘I like you’ or ‘I have a crush on you’ in English? No? Don’t worry, here are all the love phrases you need to bowl over your English love on this special day! Saying ‘I love you’ in English carries the same weight as in all languages. Use this only if you’re sure and sincere about your feelings for your partner/friend. If you don’t know how to say ‘You’re pretty’ in English, this is a good substitute, gentlemen! Say this if you are not yet sure that your romantic feelings are reciprocated. It is also a safe go-to if you’re unsure about the English dating culture. Ladies, this phrase lets your English love know how much you appreciate his looks! Don’t be shy to use it; men like compliments too. Gentlemen, don’t claim this phrase as your own! It hails from the movie ‘As Good as it Gets’, but it is sure to make your English girlfriend feel very special. Let her know that she inspires you! You’re a love champ! You and your English lover are getting along fantastically, your dates are awesome, your Valentine’s Day together was spectacular, and you’re very much in love. Good for you! 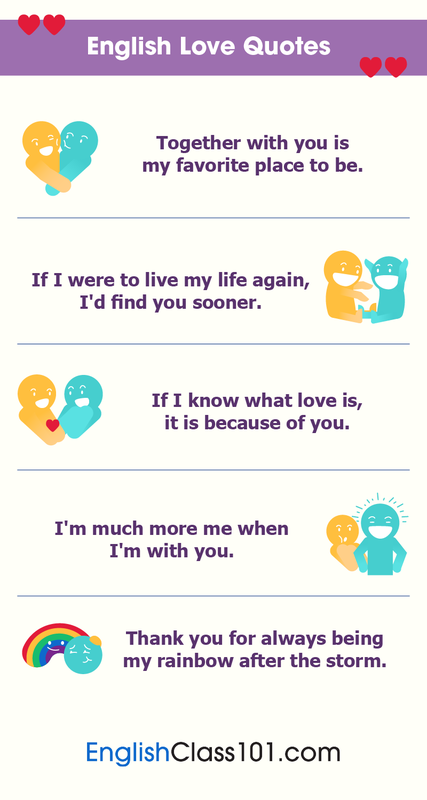 Here are some beautiful phrases of endearment in English that will remind him/her who is in your thoughts all the time. Wow. Your English lover is indeed the love of your life - congratulations! And may only happiness follow the two of you! In most traditions, the man asks the woman to marry; this is also the English custom. Here are a few sincere and romantic lines that will help you to ask your lady-love for her hand in marriage. As long as you mean it, this can be a kind thing to say. It means that there’s nothing wrong with your English lover as a person, but that you need something different from a relationship. If the relationship was very intense, and you have sent many ‘i love u’ texts in English, this would not be a good breakup line. Feelings need to calm down before you can be friends, if ever. If the relationship has not really developed yet, a friendship would be possible. 8. Will Falling in Love help you Learn English faster? Most people will agree that the above statement is a no-brainer - of course it will! Your body will be flooded with feel-good hormones, which are superb motivators for anything. EnglishClass101 is one of the best portals to help help make this a reality, so don’t hesitate to enroll now! 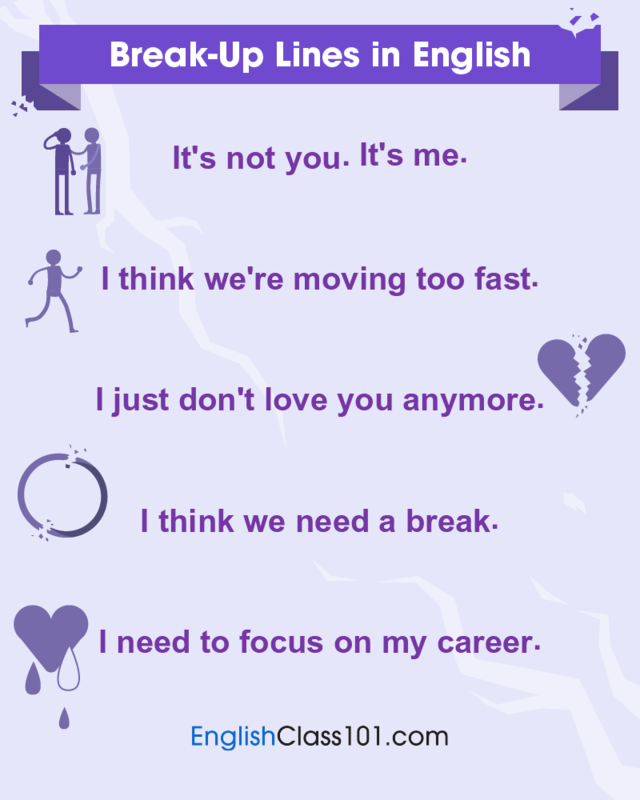 Let’s quickly look at the reasons why falling in love will speed up your learning of the English language. Three Reasons Why Having a Lover will Help you Learn English Faster! EnglishClass101 uses immersive methods and tools to teach you English, but having a relationship with a native speaker will be a very valuable addition to your learning experience! You will gain exposure to their world, realtime and vividly, which will make the language come alive even more for you. The experience is likely to expand your world-view, which should motivate you to learn English even faster. Nothing beats continuous practice when learning a new language. Your partner will probably be very willing to assist you in this, as your enhanced English language skills will enhance the relationship. Communication is, after all, one of the most important pillars of a good partnership. Also, you will get to impress your lover with the knowledge gained through your studies - a win/win situation! 3- A supportive English lover is likely to make a gentle, patient teacher and study aid! 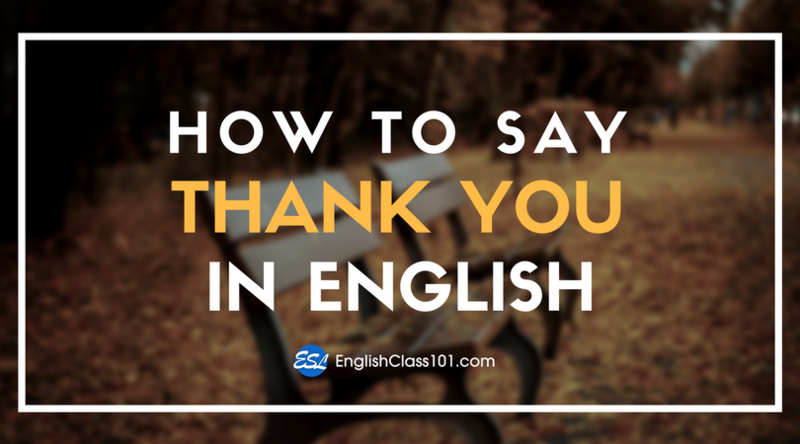 With his/her heart filled with love and goodwill for you, your English partner is likely to patiently and gently correct your mistakes when you speak. This goes not only for grammar, but also for accent and meaning. With his/her help, you could sound like a native in no time! Falling in love with a man or woman speaking English is an opportunity for both of you to learn a new language! For this reason, every lesson, transcript, vocabulary list, and resource at EnglishClass101 is translated into both English and English. So, while your partner can help you learn English faster, you can potentially also help him/her learn and master English! At EnglishClass101, our focus is to help our students learn practical vocabulary and phrases used by everyday people in English speaking country. This means that, from your very first lesson, you can apply what you learn immediately! So, when your English partner wants to go out to a restaurant, play Pokemon Go, or attend just about any social function, you have the vocabulary and phrases necessary to have a great time! 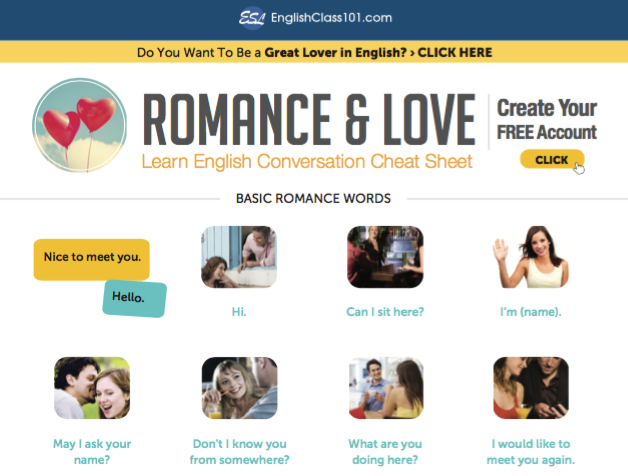 You now have access to EnglishClass101’s specially-developed sections and tools to teach you love words, phrases, and cultural insights to help you find and attract your English soul mate. A personal tutor will assist you to master these brilliantly - remember to invite him/her to your wedding! Can You Really Learn English Alone? Don’t worry, not only is it possible to learn English or any language without traditional classroom instruction: EnglishClass101 has created the world’s most advanced and extensive online language learning system. Not only is EnglishClass101 specifically designed to help you with learning a language on your own, it’s actually faster, more convenient, and less expensive than traditional classroom options! Let’s look at some of the benefits of learning English or any language alone. In today’s fast-paced world, there just isn’t time for traditional classroom instruction. Between getting to class and studying on some professor or teacher’s schedule, traditional classroom learning is simply impossible to fit in. But when you learn English alone, you can study in bed if you like and whenever suits your schedule best, making it far easier to actually reach your goal of learning and mastering the language. Speaking in front of a class, pop quizzes, and tests are just a few of the stressors you will encounter when you learn a language in a traditional classroom setting. Specifically, these are external stressors that often derail most people’s dream of learning a new language. But when you learn English alone, there are no external stressors. Without the external stress and anxiety, it becomes much easier and more exciting to study English and reach your very own goals—all on your own! The best way to learn a language on your own is to study from native speaking instructors. Ideally, you want audio and/or video lessons that teach vocabulary, grammar, and provide actual English conversations and dialogue to help you with pronunciation. EnglishClass101 has hundreds of hours of HD audio and video lessons created by real English instructors and every lesson is presented by professional English actors for perfect pronunciation. Plus, all lessons can be accessed 24/7 via any mobile device with Internet access. And, if you download the PDF versions of each lesson, you can even study without Internet access once the lesson is stored on your device! Although EnglishClass101 has more than thousands of video and audio lessons, you need not review each and every one to learn the language. In fact, EnglishClass101 has developed a feature called “Learning Paths”. You simply tell us your goals and we will identify the best courses and study plan to help you reach them in the shortest time possible. So even though you are technically learning a language on your own, our team is always here to help and make sure you reach your goals FAST! Armed with our growing collection of advanced learning tools, it’s truly a breeze to learn English alone and reach your goals! Learning a language on your own is not only possible, it’s actually easier and more beneficial for you than traditional classroom instruction. In fact, when you learn English on your own you can study at your own pace, eliminate stress, and actually increase cognitive function. EnglishClass101 is the world’s most advanced online language learning system and a great resource to help you teach yourself a new language. With the world’s largest collection of HD audio and video lessons, more than 20 advanced learning tools, and customized “Learning Paths”, EnglishClass101 makes learning a new language easier, more convenient, and less expensive than traditional classroom instruction. And the best part is: With EnglishClass101, you can study in bed, your car, or wherever you have a few spare minutes of time. Create your Free Lifetime Account now and get a FREE ebook to help “kickstart” your dream of learning a language on your own below! Yes, even beginners can quickly learn conversational English well enough to carry on real conversations with native speakers. Of course, beginners won’t be able to carry a conversation the same way they could in their native language. But, just knowing a few tips like which questions to ask to keep a conversation going are all you need to speak and interact with real native speakers! But before we get to specific suggestions, let’s first take a closer look at how having real English conversations is so vital to your mastery of the language. Communicating with other people is the very point of language and conversation is almost second nature in our native tongue. For beginners or anyone learning a new language, conversations aren’t easy at all and even simple English greetings can be intimidating and awkward. Master the Language Faster: Nothing will help you learn to speak English faster and truly master the language than having real conversations with native speakers. Conversations quickly expose you to slang, cultural expressions, and vocabulary that force you to absorb and assimilate information faster than any educational setting—and that’s a great thing! But how can you possibly have real conversations with real English people if you are just starting out? For beginners and even more advanced speakers, the key is to learn to ask questions to keep a conversation going. Of course, they can’t be just random questions or else you may confuse the listener. But, by memorizing a few key questions and the appropriate time to use them, you can easily carry a conversation with minimal vocabulary or experience. And remember, the more English conversations you have, the quicker you will learn and master the language! You don’t need to memorize 10,000’s of words to learn conversational English. In fact, with just a couple hundred English words you could have a very basic English conversation. And by learning maybe 1,000-2,000 words, you could carry a conversation with a native speaker about current events, ordering in restaurants, and even getting directions. If you want to know how to carry a conversation in English, then you need exposure to native speakers—and the more the better. Ideally, studying video or audio lessons is ideal because they provide contextualized learning in your native language and you can play them again and again until mastery. The Largest Collection of HD Video & Audio Lessons from Real English Instructors: EnglishClass101 instructors have created hundreds of video and audio lessons that you can play again and again. And the best part is: They don’t just teach you English vocabulary and grammar, they are designed to help you learn to speak English and teach you practical everyday topics like shopping, ordering, etc! 2000 Common English Words: Also known as our Core List, these 2,000 words are all you need to learn to speak fluently and carry a conversation with a native speaker! Although it may seem intimidating for a beginner, the truth is that it is very easy to learn conversational English. By learning a few core vocabulary terms and which questions to ask to keep a conversation going, just a little practice and exposure to real English conversations or lessons is all it really takes. EnglishClass101 has created the world’s largest online collection of video and audio lessons by real instructors plus loads of advanced tools to help you learn to speak English and carry a conversation quickly. Today, classrooms are no longer the only or even best place to learn a new language like English. More and more people are finding that they can easily learn a language just about anywhere they have a few minutes of spare time, including their daily commute to work. According to the U.S. Census Bureau, the average American spends over 50 minutes a day commuting to and from work, or over 300 hours a year. But rather than simply sitting in traffic and wasting the time, you can instead use your daily commute to literally learn English in just a few short months! EnglishClass101 has developed specialized learning tools that you can use on your commute to work (and home again) to master the language in your spare time. Keep reading to learn how to get your free audiobook to use on your next commute so you can see for yourself how easy it is to transform “dead time” into realizing your dream of learning a new language! Not sure if it’s practical to learn another language while commuting to and from work each day? Well not only is it possible—learning in your car on the way to and from work each day can actually help you learn and master English or any language much faster! The simple truth is that repetition is absolutely vital to truly internalizing and mastering any language. So, if you listen to audiobooks or even audio lessons on your commute to work and then repeat the same lesson on your commute home, the information is more likely to be “locked-in” to your long-term memory! Every single week, EnglishClass101 creates new audio lessons by native speaking instructors. All lessons are short, to the point, and guaranteed to improve your mastery of English. Simply exposing yourself to new information and vocabulary terms helps increase your fluency and mastery of English. So every single day, EnglishClass101 adds a new Word of the Day for you to learn and memorize during your commute. Have a short commute to work but still want to make progress towards learning and mastering English? Not a problem! Our Daily Dose Mini-Lessons are 1-minute or less and designed to improve your grammar, vocabulary, and pronunciation. You don’t need a PC or tablet to learn English during your daily commute. At EnglishClass101, all of our lessons, tools, and resources are available 24/7 via our Mobile App. That means you can access all of our audio lessons and other tools during your commute to work or any time you have a few spare moments! In addition to the world’s largest online collection of HD audio lessons, EnglishClass101 has also created several audiobooks to enhance your understanding and make it more convenient than ever to learn a language during your commute! The average commute time of most Americans is over 300 hours each year and it’s the perfect opportunity to learn and master a new language. In fact, you can use the “dead time” during your daily commute to learn a new language and potentially boost your lifetime earnings by up to $70,000 or more! Whatever your motivation, EnglishClass101 has the tools and resources necessary to help you learn a new language each year during your commute to and from work. Act now and we’ll even provide you with a free audiobook to try out on your next commute! What is Martin Luther King, Jr. Day in the United States? When is it celebrated, and why? As one of the most important holidays in the United States, Martin Luther King Day (also called MLK Day) celebrates the birthday and life of Martin Luther King, Jr.—a slain civil rights leader and a strong voice in nonviolent social movements. Find out more about this great U.S. historical figure and the holiday which seeks to commemorate him. 1. Why Should You Know About Martin Luther King, Jr. Day? Learning about United States holidays is one of the first steps in understanding its culture and the history that made the country what it is. Each country has people and historical figures it celebrates, and the United States is no exception. Martin Luther King, Jr. is considered one of the most important historical figures in the United States, and for good reason. Not only did he dedicate his life to social reform in the country, but he did so in a peaceful and respectful manner, serving as an example of how a quiet voice can create a loud echo. He fought to end discriminatory laws, especially against people of color; he gained followers, and ultimately served as one of the greatest voices in the civil rights movement against discrimination. In particular, he sought to provide African Americans with rights they hadn’t known before. The United States truly wouldn’t be as free and open a land as it is today without this man, and so we celebrate Martin Luther King, Jr.’s birthday each year. 2. What is Martin Luther King, Jr. Day? Martin Luther King Day is the celebration of this great figure’s birthday, as well as the commemoration of all he accomplished for the rights of colored people in the United States. But is MLK Day a national holiday? This is a federal holiday, meaning that most schools and places of business are closed. It’s a day to observe the sacrifices made and the example set forth by Martin Luther King, Jr.
3. When is MLK Day? Martin Luther King, Jr. Day takes place on the third Monday of January as this is close to his January 15 birthday. 4. How is MLK Day Celebrated? 1- Is MLK Day a National Holiday? While not a national holiday, MLK Day is observed in a variety of ways throughout the country, and its observation can vary from person to person. Martin Luther King, Jr. Day is a federal holiday in the United States, which means that the majority of schools are closed as well as some places of business. However, some schools see this as an opportunity to better inform students about Martin Luther King, Jr. and what he stood for, and decide to remain open with classes centered on this topic. In 1994, President Bill Clinton signed a document (the King Holiday and Service Act) which essentially asks United States citizens to use MLK Day as a day of charity and service. In order to reflect the heart of service that King possessed, many people on this day choose to perform acts of service for others. This is often volunteer work, though it can take many forms. One notable example of this is the Greater Philadelphia King Day of Service, where thousands are known to volunteer their time, energy, money, and goods for causes or charities they’re most passionate about. While Martin Luther King Junior day originated in the United States and is most widely celebrated here, there are a few other countries and cities which also choose to commemorate this day in some way. Hiroshima, Japan: This city celebrates MLK Day and seeks to point out similarities between its desire for peace and the life that King lived—what he stood for. The celebration is put on by its mayor, Tadatoshi Akiba. Toronto, Canada: In Toronto, Canada, this day is celebrated on a more personal level and businesses still remain open. Jerusalem: Jerusalem is a city which can relate to King and his ideals through the Bible; those who celebrate MLK Day in Jerusalem see a correlation between King’s assassination and the attempted murder of “the dreamer” Joseph in the Old Testament. Wassenaar, The Netherlands: The celebration of Martin Luther King, Jr. Day in Wassenaar, The Netherlands, is unique. Music is a large component of this day and the song “We Shall Overcome” is sung. Martin Luther King, Jr.: The man behind the holiday. Activist: Someone who acts strongly for a particular cause. Freedom: Release from captivity; ability to live unhindered. Boycott: To completely stop using a certain product or buying from a certain company, usually because their beliefs or values differ greatly from one’s own. African American: Black citizens of the United States; peacefully Martin Luther King, Jr. fought for their rights. Human rights: The basic rights that it’s believed each person has, no matter who they are. Racial equality: People being treated equally, despite their race. Pastor: A church leader who usually gives sermons to the congregation and is in charge of various aspects of the church. Freedom Riders: People who rode on interstate buses in areas of the U.S. which were still segregated, as an act of opposition to these places’ failure to enforce non-segregation. They rode in groups of various races. Civil rights: Similar to human rights, though implementing a greater focus on ensuring that the government can’t take these rights away. I Have a Dream: Martin Luther King, Jr. gave a speech in 1963, called “I Have a Dream.” This is considered one of the most powerful speeches ever given; it focused on ending racism and allowing African Americans civil rights. The Sit-In Movement: Following in Martin Luther King, Jr.’s footsteps, many African American students used sit-ins as a nonviolent form of opposition and as a way of getting attention from the press. Essentially, they would go to a segregated location, ask for service, be denied, and refuse to leave after being denied. Racial segregation: Racial segregation involves people of different races being separated in daily life (e.g. in the United States, it used to be that white people rode on one part of the bus, and black people the other). Nonviolent resistance: Nonviolent resistance is a peaceful form of opposition, in which the opposing party or parties make a statement in a way that doesn’t harm anyone. Orator: An orator is a highly skilled public speaker, such as Martin Luther King, Jr.
Nobel Peace Prize: The Nobel Peace Prize is a greatly commendable award given to someone who has established themself as a successful fighter for peace. King won this prize in 1964. The March on Washington for Jobs and Freedom: This march took place in Washington, as a way of demanding more rights for African Americans; this is where King gave his “I Have a Dream” speech. Letter from a Birmingham Jail: This letter, written by King, is essentially an argument for nonviolent resistance. Civil disobedience: Noncompliance with laws, such as taxes, in order to peacefully resist. Birthday of Martin Luther King, Jr.: A holiday to celebrate the birth of Martin Luther King, Jr. each January. To hear the pronunciation of each word, be sure to check out the Martin Luther King, Jr. Day vocab list on our website where you can listen to audio files with each word. Martin Luther King, Jr. Day really is one of the most quintessential holidays in the United States as it marks a significant time for African Americans—a time when their voice was finally able to be heard and change began to take place for the better. Martin Luther King, Jr. is honored for good reason; his involvement in progressing the civil rights movements for African Americans and his peaceful guidance towards racial equality continue to unravel today as the United States seeks equality in more ways than ever before. To learn even more about U.S. culture, be sure to visit us at EnglishClass101.com! You’ll find an array of helpful blog posts, cultural information, and vocabulary lists. Also be sure to check out our MyTeacher app for a one-on-one language-learning experience! We hope this article was helpful for you, and wish you the best of luck on your English-learning journey! Greeting another is one of the most important things we do in social interaction. Did you know that even cats and dogs greet? They touch their noses together, even with other animals! Therefore, greeting someone in their own language is probably the best way to win immediate favor. Nearly every language has different ways to say hello, depending on what time of the day it is, what the situation is, and also who you address. Greetings can also differ according to dialect, such as American English vs British English, etc. For the purpose of the article, we will focus on American greetings. We will only look at greetings when you meet someone, not at ways to say goodbye. So, let’s look at some of the many ways to say hello in American English. As the name suggests, formal greetings are used in more formal situations. This would be when you address someone you don’t know well, or who is senior to you in some way. You would use this, for instance, when addressing your boss, or your elderly neighbour or a complete stranger who is older than you. Other than these, there are not many formal or polite ways to say hello in English. Literally, this greeting is a way to wish someone well. It is a short way of saying: “I wish you may have a good morning/afternoon/evening”. Say “Good morning” any time after sunrise. Use “Good afternoon” any time after 12pm. 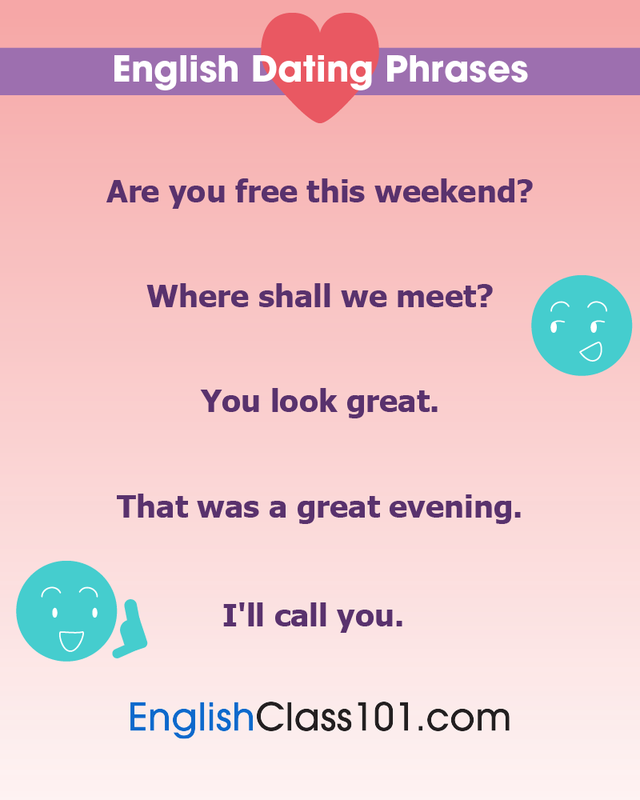 Use “Good evening” any time after sunset. As mentioned, this is a polite way to greet someone who is senior to you in some way. It’s not an error to greet a friend like this though, so don’t worry if you do! Further, you may or may not wish to offer your hand for a handshake if you meet the person for the first time. Another phrase with which to follow this greeting, is “It’s nice to see you again”. This you also say only to someone you already know or have met before. What are the formal ways of greeting in your language? Informal greetings are much more abundant in English. Informal greetings are usually OK for casual situations, and is used upon meeting or seeing someone. Hello was initially used in the same way, but over time, it turned into a way to greet someone. Previously, in western countries, it was polite for men to also lift their hats in greeting! It is suitable for use any time of the day. It’s certainly the most neutral and simplest way of greeting someone. It’s not completely unsuitable to use as a more formal greeting, such as when you address someone who is senior to you in some way. When you meet someone new, you can also offer your hand for a handshake. 2- Hi / Hey / Hi there! This casual greeting is well known and popular around the world. You can use it in all informal situations, irrespective of who you address. This is a more casual way of saying hello, even when you meet new people. You can offer you hand for a handshake, if you choose. You can also say ‘’Hey! '’ when you run into a friend or someone you met before. “Hi there!” is particularly handy if you don’t know or cannot remember someone’s name! Of all the different ways of saying hello, this one certainly brings up images of cowboys, belt buckles and the famous southern American drawl! It is said to have originated in Texas as an informal greeting. The word ‘’Howdy'’ is a contraction of the more formal greeting phrase: “How do you do? '’, and is a way to ask after someone’s wellbeing. It has become so popular that a Texan university uses it as a slogan. Its use is pretty similar to “Hi”, in the sense that normally no answer is expected. When you meet someone for the first time, or bump into a friend somewhere, this is an acceptable form of greeting in any casual situation. You could also offer your hand for a handshake. If you really want to do it the Texan way, greet a group of friends with “Howdy, y’all!” Howdy can be used any time of the day. However, use it mostly with peers or older people you have already met and are on friendly terms with. This greeting serves a double purpose. It’s a way of saying hello, and it’s also a way of asking about what might be happening. According to StackExchange, “What’s up?” has old origins: “In a letter written in 1838, the novelist Elizabeth Gaskell wrote I did not mention a word to Lucy but she must have guessed something was ‘up’“. The phrase was made popular and probably widely known by the cartoon character, Bugs Bunny, with his signature phrase: “What’s up, Doc?” The contraction “Wassap?” is even more casual. This phrase can be used any time of the day or night. This way of saying hello is probably best used with people you know. That, or if you specifically want to know what’s going on with someone or something. If you are friends with them, and your relationship is relaxed and casual, this is a suitable way to greet both young and old people. This is the casual version of ‘’Good morning'’ and ‘’Good evening'’. It is fairly safe to greet anyone this way, no matter of their age. You might not want to meet a dignitary or royalty like this, though. 6- Hey, long time no see! This phrase is thought to have originated from pidgin English, and some consider it offensive and racist. However, it is widely used across the Americas today, and it literally means you haven’t seen someone for a long time. It seemed to have appeared the first time in literature in W.F. Drannan’s book, Thirty-one Years on Plains, which was published in 1901: ‘When It we rode up to him he said: ‘Good mornin. Long time no see you’.The speaker is an American Indian. However, the phrase became popular only the last ten years or so. When you haven’t seen a friend for a long time, this is an appropriate greeting. It is perhaps more suitable to address your younger friends this way. That’s not to say that older people will necessarily be offended—if you know them well, and you have a more relaxed friendship, it should be fine! 7- Hi, how’s it going? Probably best used for your younger friends, or when you’re greeting a group of friends in a general sort of way. Often, when friends meet up, the ‘’Hi'’ falls away. This greeting is a contraction of “How’s everything going?” It means the same as “How’s it going?” and is used in the same way. Here, the ‘’Hey'’ also falls away when friends who know one another well meet! ‘’Yo! '’ was first used in the 1400s as an exclamation of incitement or warning. Apparently it originated among sailors. In the 1950s in the U.S., it became popular as a way to say ‘Hi!”’, or to show surprise. Much later, in the African-American community, it changed into an exclamation, “following or punctuating an utterance for emphasis or as a general conversational filler”, according to StackExchange. This is a very informal greeting! Best use it only with your friends of the same age, and younger. 3. 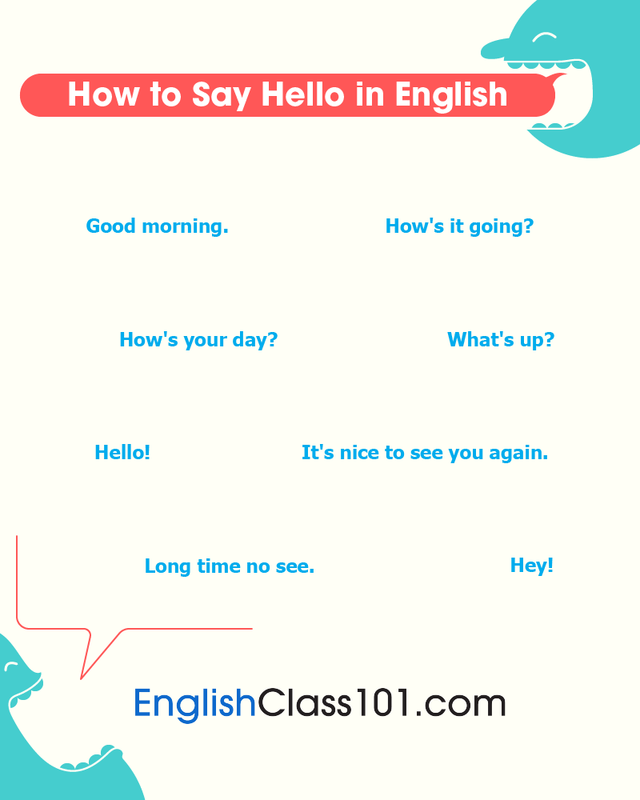 Why Choose EnglishClass101 To Teach You The Best Ways To Say Hello? Studying English through EnglishClass101 has many advantages! New audio and video lessons every week. A free online course with a lifetime access. The course includes free audio books and video lessons, plus vocabulary building tools. eBooks with lessons you can listen to and read in more than 200 pages of transcript, grammar and sample sentences! Podcasts on iTunes that will have you speaking after the very first lesson! Lively online communities on Facebook, Twitter, Instagram and YouTube! What’s not to love?! 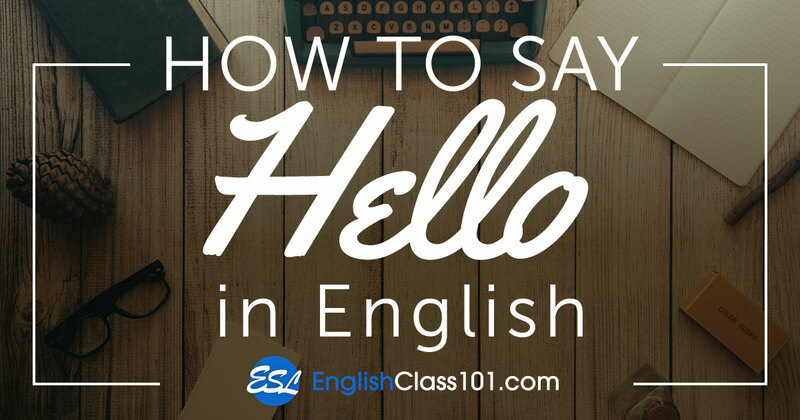 Learn so much more than the ways to say hello in English!